This is an IFS 2015 liveblog which means everything was written at-the-moment. In Day 2’s first breakout session, along came Mr Jaco Putter from VBMS. The fellow from the Dutch cable laying company, who has featured in this blog twice previously, followed a presentation from Srinath Neelawathura from IFS on the benefits of the new system for multi-companies. Basically, it can be needlessly complicated managing resources and processes from faraway locations; wires get crossed (so to speak), repetitions are made, time is wasted. According to Putter, with insistence from VBMS, the new IFS Applications 9 has made everything easier for multi-companies handling and tracking services abroad. VBMS has three companies, and Putter says there’s often a lot of wasted time and energy spent on managing contracts and renting equipment. 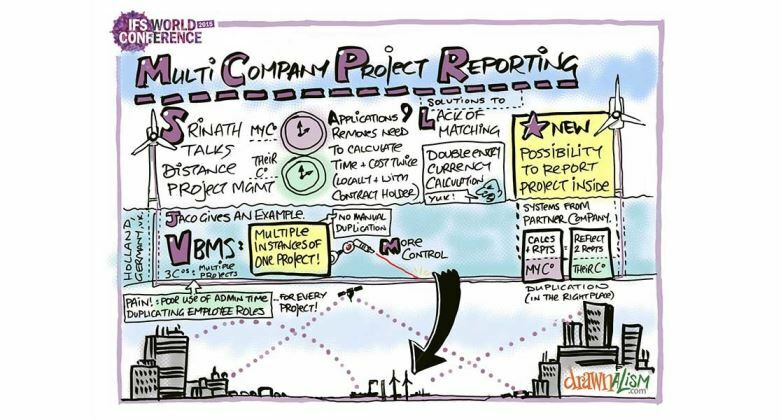 But with the new IFS Applications 9, their Multi-Company Time Reporting (MCTR) became Multi-Company Projecting Reporting (MCPR). That one letter difference betrays a host of improvements made. Where previously Putter had separate entries for each company on a single project, MCPR has allowed him to merge them into one shared project. Where employee files had to be created multiple times in joint projects, now they are automatically provided. Where activities linked to the project were not visualised, they now are. Where activities could only be linked one-to-one, now you can link processes to multiple projects quickly and easily. “There’s simply less waste,” he explained.